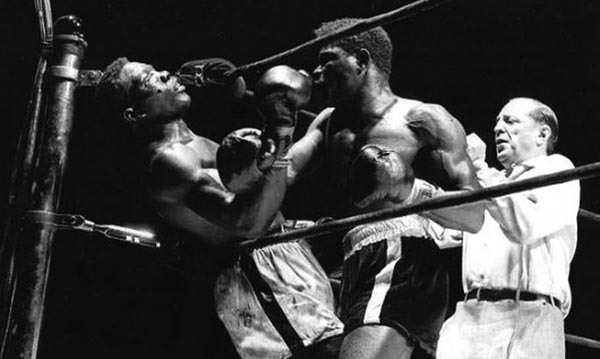 Boxers Benny Paret and Emile Griffith, referee Ruby Goldstein. In addition to playing Albert, Clapp plays the announcer. Gifted actor John Douglas Thompson (Louis Armstrong in “Satchmo” and several title roles – Othello, for example – in Shakespearean tragedies) plays Emile, and Kyle Vincent Terry plays Young Emile. Victor Almanzar is Emile’s partner and caregiver Luis. Starla Benford plays Emile’s mother Emelda and Krystal Joy Brown his wife Sadie. Sean Boyce John has the role of rival boxer Paret. Richard Gatta has the silent role of referee Reuven ‘Ruby’ Goldstein, a past boxer who was once known as “Jewel of the Ghetto.” Michael Greif (“Rent,” “Dear Evan Hansen”) directs. 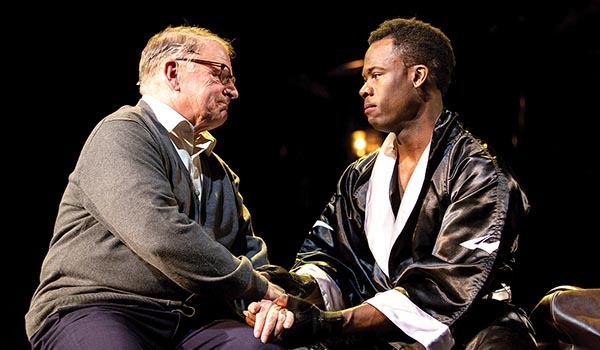 “Man in the Ring,” Huntington Theatre Company at Wimberly Theatre, Calderwood Pavilion, Boston Center for the Arts, through Dec. 22. Bostonscene.com.